Advanced Force on Force takes what is taught in the Intro course and builds on that curriculum by increasing the intensity of the scenarios. 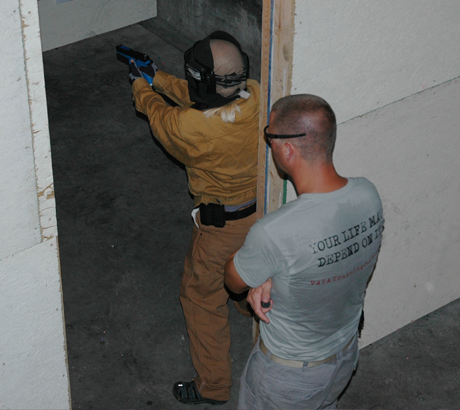 Our expert instructors will put you into realistic situations against seasoned/multiple aggressors to test your skills. Using our real, converted FX pistols, the scenarios will put you in and around buildings, vehicles, and other everyday environs. Working from concealment, you will quickly learn what it's like to have to use your pistol to defend your life or the life of a loved one. After each scenario, a debrief will be conducted to discuss what went right and what could have gone better. YOU WILL GET SHOT WITH FX MARKING CARTRIDGES, IT WILL HURT, AND IT WILL BE THE MOST REALISTIC TRAINING OF YOUR LIFE. Stiff pistol belt, wrap around shooting glasses, long pants, long sleeved shirt, gloves (that you are able to shoot in). *Caution: This course involves getting shot at with Simunitions FX marking cartridges. The marking cartridges are painful and can damage clothing and break the skin. This course will involve physical as well as mental stress. Participants must be in good health and physical fitness to attend. YOU WILL GET SHOT WITH FX MARKING CARTRIDGES, IT WILL HURT AND IT WILL BE THE MOST REALISTIC TRAINING OF YOUR LIFE.